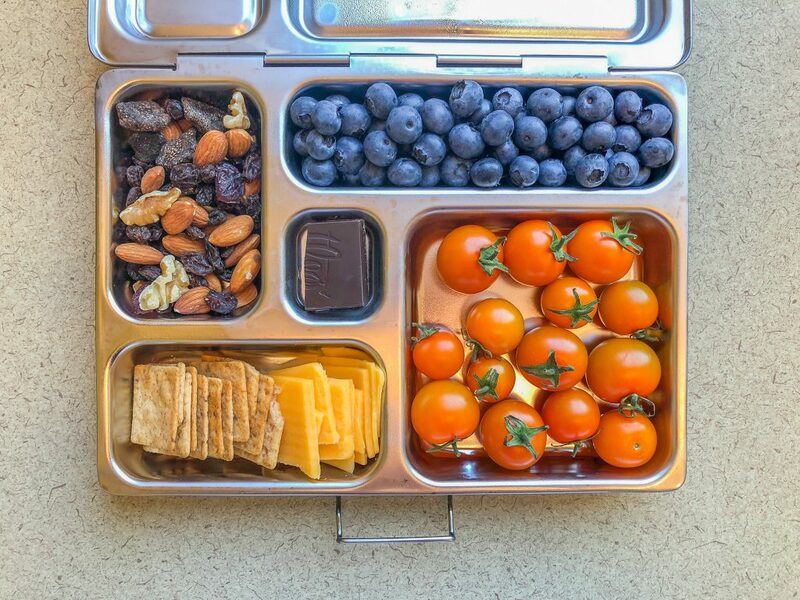 Lunch packing in the summer is easy. Certainly if you have kids, I’m hoping you have a few months off from this daily task. But for the rest of us, taking a lunch to work happens year round. 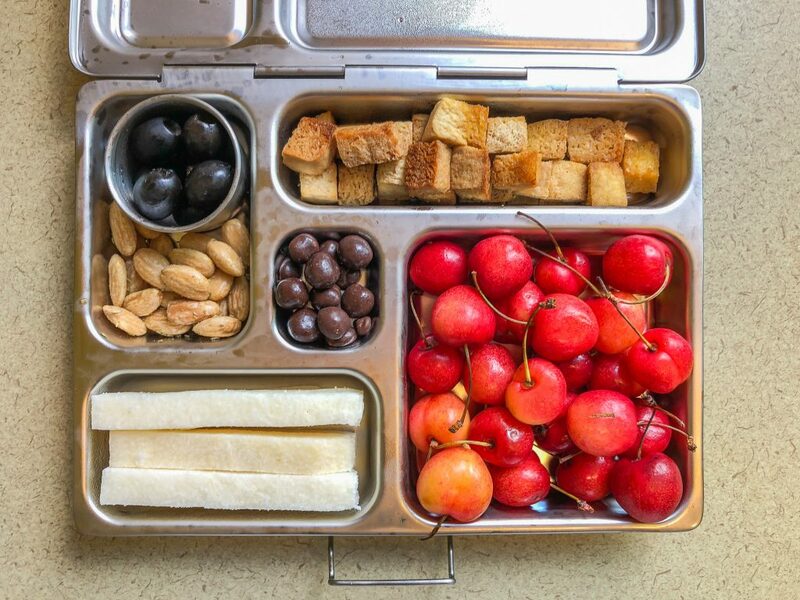 And summertime offers a bounty of veggies and fruits to fill up those cute little compartments in my bento boxes. I’ve got several now, including two really cool new ones to show you. And I’ve packed them full of yummy grub the last couple months to get myself fed at noontime. Hopefully the pictures will inspire some new lunch ideas for you. The fanciest is my new PlanetBox stainless steel number. 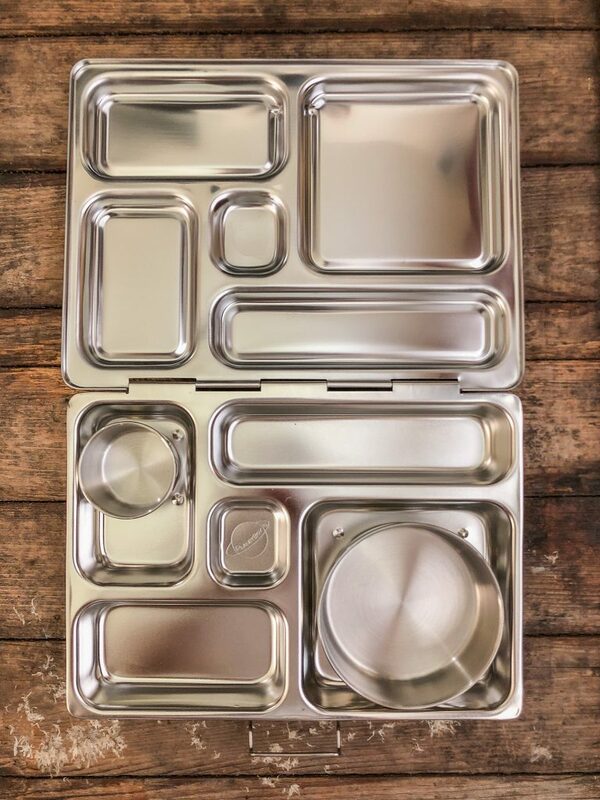 It’s pretty pricey but it feels sturdy and unique and the design makes my bento-loving heart happy. An empty lunchbox is good. Makes me think of the possibilities. 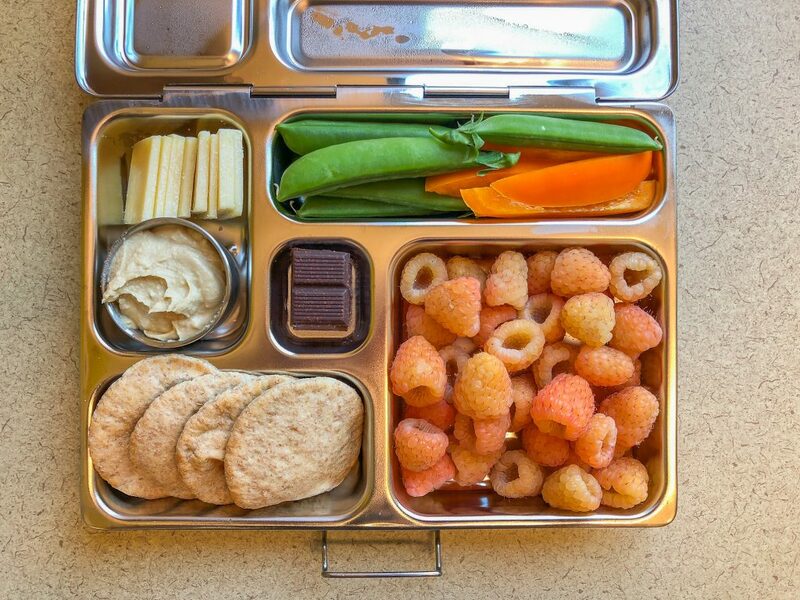 But a full lunchbox is even better. Let’s get to the fillins. From a nutrition perspective, this covers all the bases, if we’re thinking of the food groups. 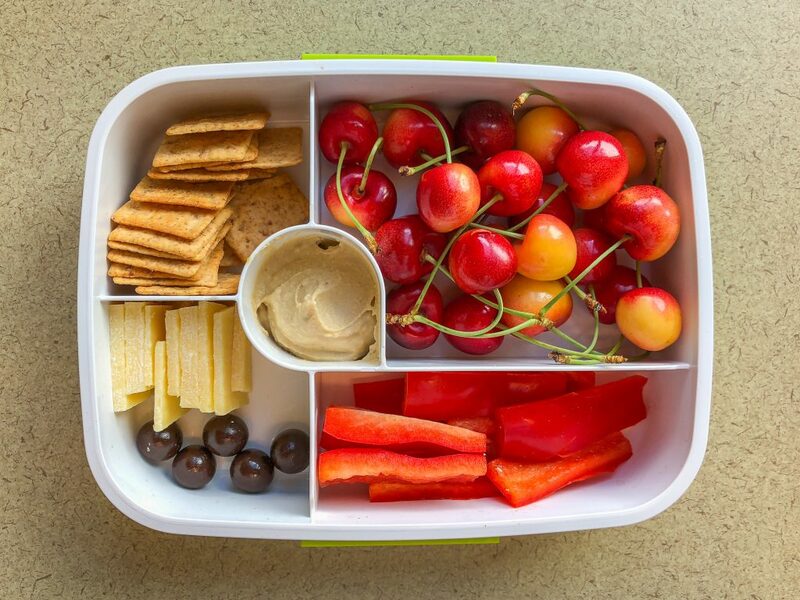 The cheese takes care of dairy, peas and peppers are representing for vegetables, and raspberries have got the fruit group covered. The pitas fill the whole grain requirement and the hummus adds some (plant) protein. The chocolate, of course, counts as discretionary sugar and fat calories. One of the reasons I like the bento style so much is because it helps me use up small amounts of stuff in the fridge and pantry; in this case, a small portion of leftover roasted potatoes. They fit perfectly here and tasted great eaten cold. The tahini spread served as a perfect dip for my summer strawberries. 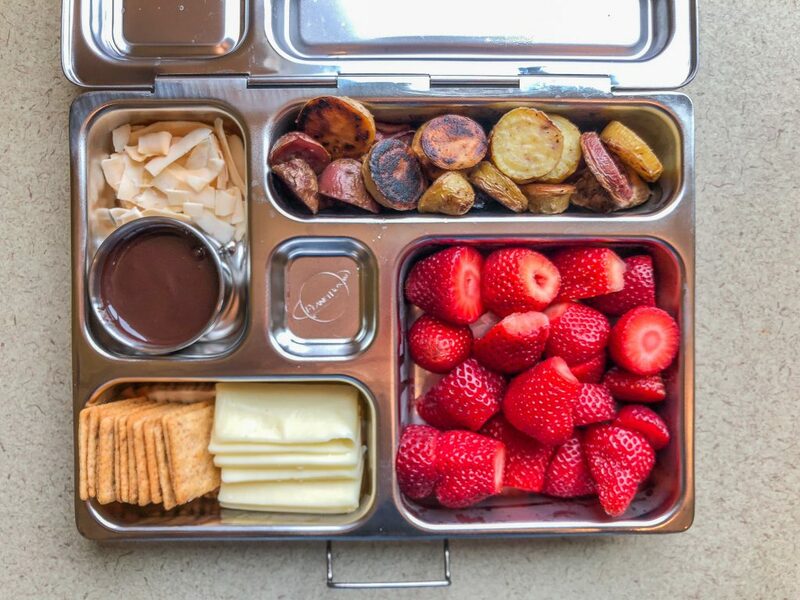 We’d packed a picnic for an outdoor concert the night before I built this bento lunch. So it came together quickly, what with so many extra finger foods lying around waiting to be eaten up. 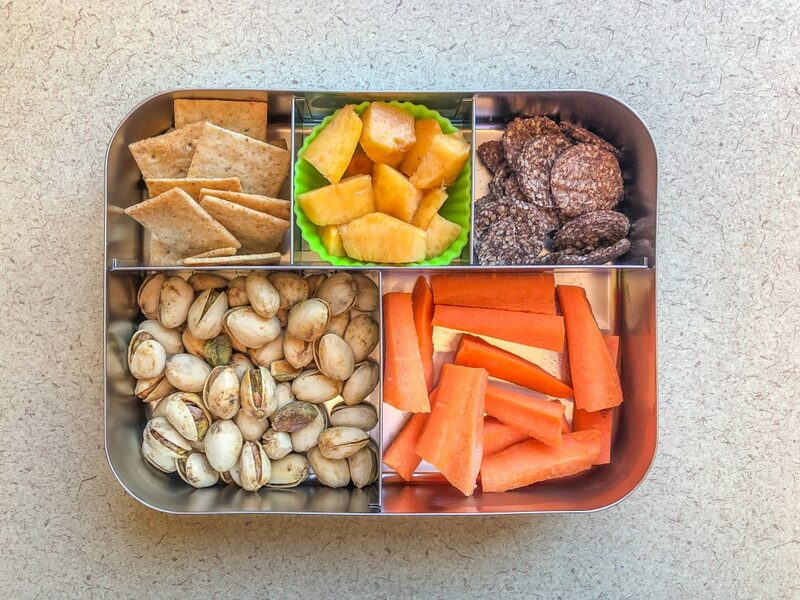 As with most bentos, no silverware was necessary in the eating of this lunch. I ate all these sweet, salty, and savory bites with my fingers. 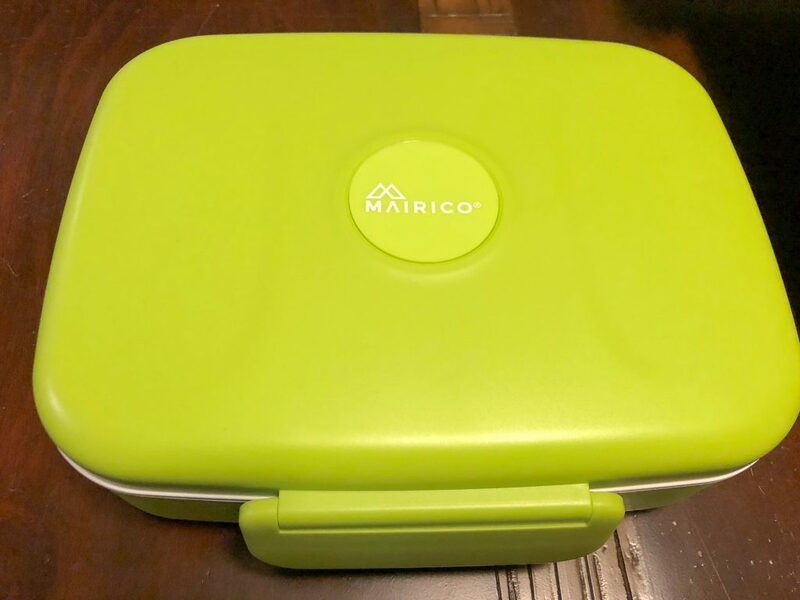 My other new addition is the Mairico Leak-Proof Bento. Strangely, it’s not currently available on Amazon or the company’s website. And the reviews are mixed with some folks complaining of leakage. My experience has been entirely positive. A cover goes on over the compartments before the green lid gets clamped on which is supposed to provide an extra layer of protection. I’ve had no leakage but I typically keep it horizontal for its trip to work with me. 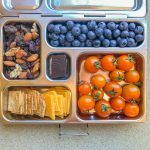 We’re starting to get some repeat offenders here, so you can see what some of my go-tos are when I’m lacking lunch inspiration or packing in a hurry. Hooray! Peach season is finally here! And so is blueberry season! I make this crowd-pleasing salad every year, several times when fresh blueberries are available here in Whatcom County. I got the recipe from a friend and I need to find out where it originally came from so I can post the recipe at some point. Whenever I take it to a potluck I get asked for the recipe. The salad itself is as listed above: blueberries, cooked brown rice, toasted pecans, and toasted coconut. The dressing is the real star though, made with silken tofu, lemon juice, maple syrup, canola oil, cinnamon, vanilla extract, and salt. I sure was glad to find leftover tofu in the fridge, which seemed a substantial start to things for this lunch. 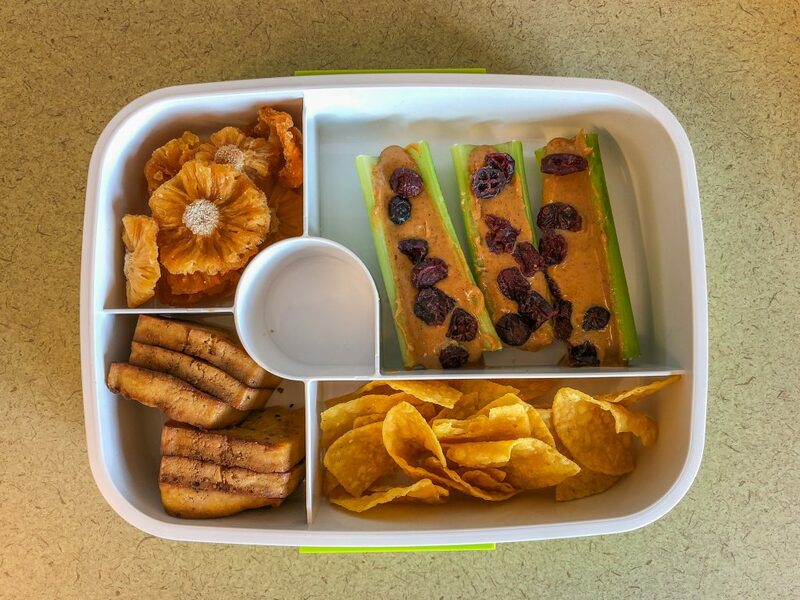 Dried fruit and tortilla chips are pantry staples for our house, so those are usually available when I’m in a bento pinch, and ants on a log have been a regular in lunch boxes long before I ever started packing my own. 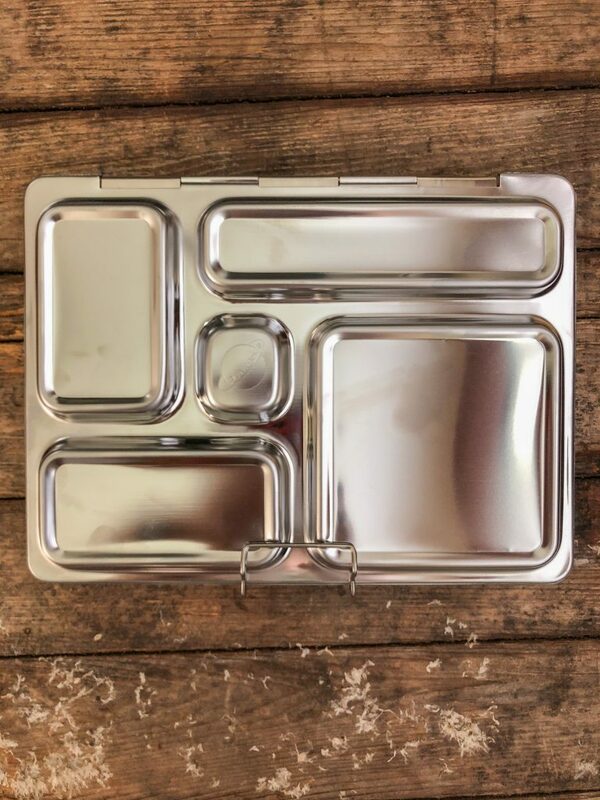 This one was thrown together in a hurry, in my workhorse LunchBots bento box. These almond flour crackers are a new find and a new favorite. They’ve got a teensy bit more protein than regular wheat flour crackers (3 g vs. 2 g) and the flavor is great. This bento definitely relies on more packaged foods than fresh foods, but I tried to balance it out. I think I’ve mentioned before in a snacks post that these seasoned pistachios are dangerously good. And they bring 6 more grams of plant protein to my lunch. 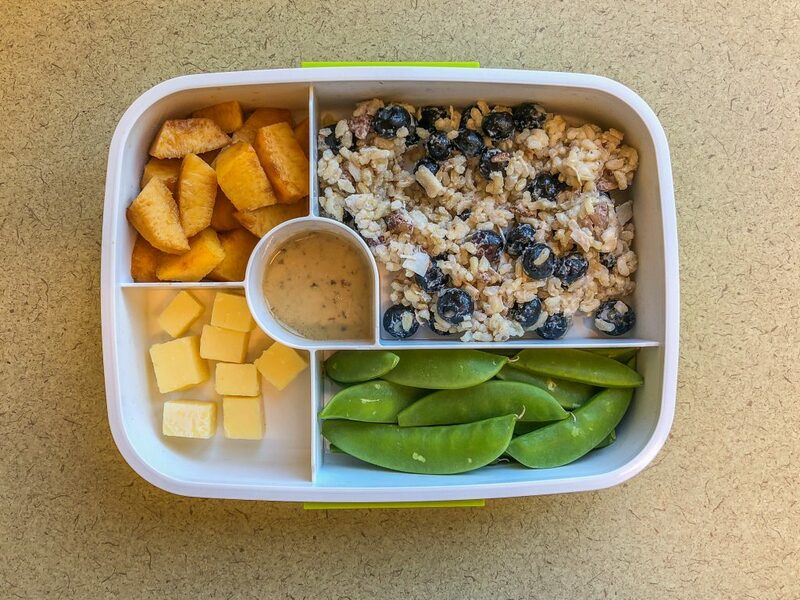 There’s still a whole lot of August left, so I’ve got many days of bento packing ahead of me. 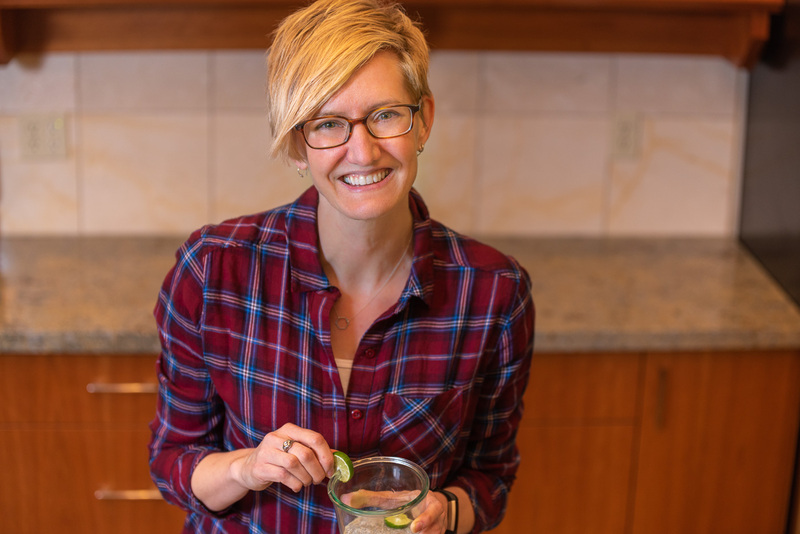 My plan is to continue taking advantage of fresh vegetables and fruit readily available as long as I can before fall arrives, classes are back in session, and another easy summer is on the books. What’s your favorite summer season lunch item that only comes round once a year?